While Hanukkah at Maxwell’s is a long-time Yo La Tengo tradition, another of the band’s regular gigs is the WFMU Marathon where YLT plays requests which are invariably eclectic covers. While Night 3 of this year’s Hanukkah was a tremendous show for a variety of reasons, it was one cover that stole the show. This night will forever be known as the “Sister Ray” show. I asked YLT’s long-time superb FOH Mark if he’d ever seen them play the song — they have done a ton of VU covers over the years — and he only remembered one other performance of “Sister Ray”. Perhaps fueled by the guest performances of various members of the Feelies, the band’s set was a scortcher from the get-go. On any other night, the band’s new cover of Neil Young’s “Time Fades Away” would have been the story, it was the night’s last song where the magic reached its peak. This wasn’t a simple walk through one of the Velvet Underground’s most compelling songs, it was a full-on seventeen-minute immersion into the song. Glenn Mercer and Bill Million joined and the noisy axe trio with Ira was a breathtaking display of authentic garage style guitar. I recorded this show in the same manner at the other nights and the sound is superb. Enjoy! 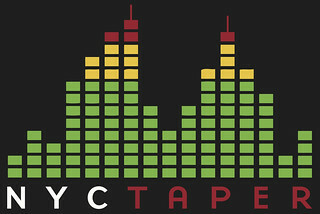 If you download this recording from NYCTaper, we expect that you will PLEASE SUPPORT Yo La Tengo, visit their website, and pre-order the new album Fade from Matador Records [HERE]. 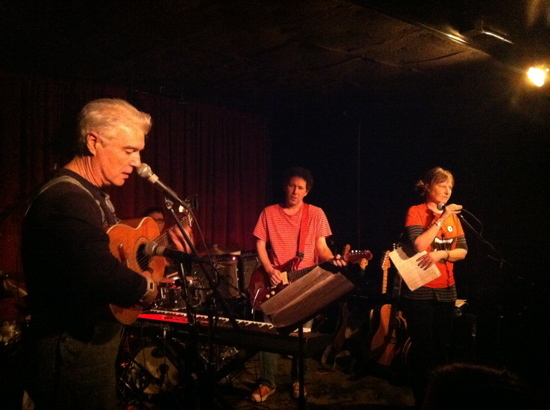 [David] Byrne, last seen with the Tengos at Maxwell’s during Hanukkah 2002, came up at the end of the first set to add harmony to “Tears Are In Your Eyes.” The once head-Head introduced a new song, an addendum to his disco-pop opera Here Lies Love. Speaking of “the People Power Revolution” in the Philippines and declaring he intended to write an anthem, Byrne looked and sounded–in his overalls–as if he’d stepped straight from some neo-futurist pro-union propaganda wallpaper as he recalled, for a moment, the Velvet (Czechslovakian), Orange (Ukranian), and Jasmine (Tunisian) Revolutions. The song itself was more typically Byrne, a ballad in Caetano Veloso mode, lush chords and a melody cleverly knotted to accommodate tons of words — and, one night only, Georgia Hubley adding an empathetic sweetness to the chorus. But the winner of Byrne’s mini-set was a mournful, Tengoized “Thank You For Sending Me An Angel,” Georgia translating the song’s galloping tom fills into lonesome mallet thumps. Perhaps energized by the excitement of the Byrne appearance, YLT came out smoking for the second set and treated the crowd to a phenomenal 15-minute “Pass The Hatchet” among other treats. The appearance late in the second set by The Feelies’ Glenn Mercer rounded out of the evening in perfect fashion, and the rousing closing Velvet Underground cover is provided as a stream below. I recorded this set from our standard location in this venue. On this night, YLT was without Mark their longtime soundman. Carson, the house engineer at Maxwell’s filled in quite admirably and the sound quality in the venue all night was superb. This high quality of this recording is a testament to Carson’s talents. Enjoy! This concert took place to raise money for Japanese Earthquake/Tsunami relief through the charitable organization Peace Winds Japan. A donation to that charity will be required in order to download this recording. If you wish to download this recording Email nyctaper with a copy of your charitable donation receipt from Peace Winds Japan and specify if you would like to download the concert in FLAC or MP3. PLEASE DO NOT REPOST OR PASS ALONG THE DOWNLOAD LOCATION. Support the cause. If you email nyctaper for access to this recording, that means you’ve already donated to Peace Winds Japan. Thank you for your donation to support Japanese Earthquake/Tsunami Relief.